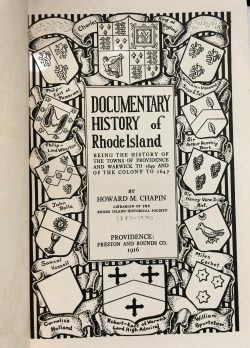 Chapin, Howard M. Documentary History of Rhode Island. Providence: Preston and Rounds, 1916 and 1919. Two volumes, octavo, blue cloth, 278 pages including index and 192 pages including index. A few illustrations and photos. Uniform in size, but the blue cloth of the volumes varies slightly. Volume 1 covers Providence and Warwick to 1649 and the Colony to 1647. Volume 2 is the history of Portsmouth and Newport to 1647 and the court records of Aquidneck. Both volumes are limited to 250 copies printed. A World Cat search shows 205 copies in libraries. In addition, the Redwood Library has 4 sets. This leaves little supply on the market; hence this set is quite scarce. In 36 years of selling books, we have never before owned this Chapin. An accession stamp of 1949 in Volume 1, otherwise both copies are in Good condition. No markings or stamps. Two volumes – $200. -Chapin was librarian of the RI Historical Society for decades.